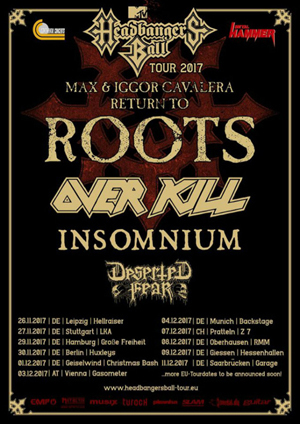 MAX & IGOR CAVALERA Confirm 2017 European "MTV Headbanger's Ball Tour"
MAX & IGOR CAVALERA have announced their return to Europe this Fall on the "MTV Headbangers' Ball Tour 2017". Tagging along for the ride will be special guests OVERKILL, INSOMNIUM, and DESERTED FEAR. A video trailer has been released and you can check it out below.